For the past few years I’ve wanted to drive from San Francisco to Seattle via the Oregon coast. Now we’re doing it! But very slowly. We’ll be on the coast traveling north for the next five weeks, getting over to the Portland area mid-August. We were very happy to escape the mosquitoes. The night Mr. Misadventures did a sunset shoot (and I stayed in the car) he missed spraying the upper right part of his arm and he got ravaged. It made him ill and we pretty much stayed put the entire holiday weekend. On Tuesday, we arrived to our first port-of-call, Brookings. It is only about 10 miles from the California border and we will be gently traveling north from here. The town is decent sized and the first thing we did on Tuesday night was go eat sushi! The last time we ate sushi was JANUARY in San Diego. Anyone who knows me from my previous life will know that’s pretty significant. Anyway, the sushi was good, but expensive! I paid San Francisco prices in a tiny coastal town. I got my itch scratched and will be spending my money on fresh fish and groceries that we can make on our own. Dungeness crab season is over, but we were able to buy some fresh rockfish which we ate for lunch yesterday, it was delicious. We are staying at the port, the fishing boats are right in front of us, so you can’t get much fresher! We have done some reconnaissance, scouting for spots, but the weather hasn’t been 100% cooperative. We’ve had foggy mornings and overcast evenings. Today its raining and it is supposed to continue through the weekend. We had some fun in the tidepools, but we haven’t done more than that. One reason is that I sprained my ankle on Wednesday morning. I got to the bottom step of our RV and forgot that we are on a slight curve so I stepped down on the ground and twisted on the incline. I’ve iced and elevated and it is feeling way better! We’ll be able to go on a coastal hike. I’ve been busy supporting my Corning Gorilla Glass campaign, you can catch it on Instagram or Twitter and I’d love your support in likes, comments and retweets – thanks! 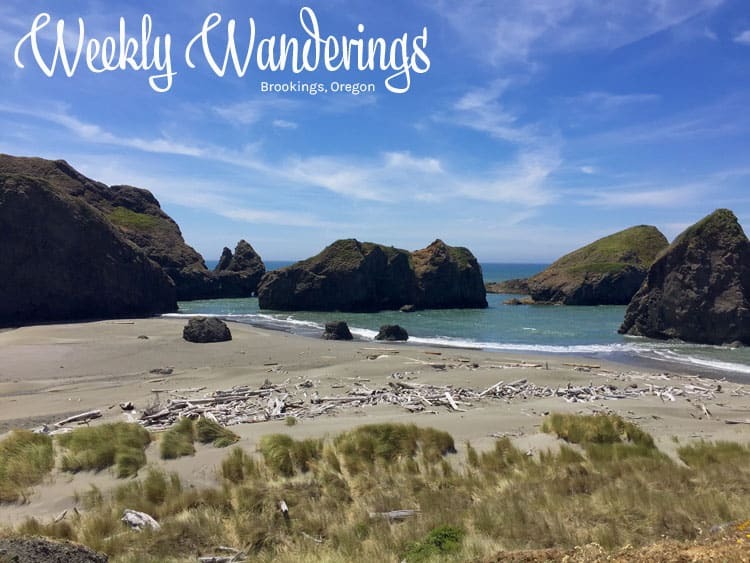 Portside RV Park – Brookings, Oregon. Wow, sounds like an adventure, can’t wait to hear more about your trip! The mosquitoes have been bad this year here too in BC, Canada. It has been cooler and wetter than usual but I am hoping August will roll around and redeem my summer. After all my wedding is ALL outdoors so fingers crossed the weather improves! Are you coming up through BC at all? Come through the Okanagan!! I’ll be away from September 23-October 8th so I might miss you but let me know despite! I can recommend some great places in Vancouver or the Okanagan. @Murissa, not on this leg. The farthest north we are going is Portland, then we are making a right turn towards Palouse then Montana. We will be back in the PNW in Feb/Mar and will definitely get to you! You visit some beautiful places.